The internet running forums are full of information about how to enhance running performance. Most of these are focused upon training tips, running form, diet, and x-training, etc. Very few focus upon the mind, generally with the assumption that mind and body are two separate entities. However nothing could be further from the truth. Running is about a sense of conviction, a purpose, and a complete mind and body orientation. So one of the major influences about how we perform as a runner is about how we integrate mind and body. If one watches the final stages of the 2013 Great North Run Half Marathon where Mo Farah challenged Kenenisa Bekele, one will see that both runners performed far above what their bodies could normally provide. High performance running is state of mind. The author believes that running meditation is a key to high performance running. Physiologically, running meditation catalyses the release of energy and pain suppressing endorphins that aid high performance. Through running meditation, a runner is able to maintain a pace just under the VO2 anaerobic threshold, which is actually a very comfortable running pace, when a person is running within their balance and focus locus. Often, running slower is more tiring as it is characterized by an inefficient running style which requires more energy. To a balanced and focused running style, just look at the ease many world class African marathoners run, as demonstrated by Wilson Kipsang in the 2013 Berlin Marathon; balance and total focus. The integral parts of running meditation involve breathing, balance, focus, and thought. Through breathing we connect to the world around us, and thus the rhythm of breathing is very important. Breathing both reflects and is a response to the current conditions of the day, and helps us adapt. Therefore breathing will change according to whether we are running up hill, down dale, or along the flats. Breathing drives our action, and how we breath responds to our focus and action. It's a complex interdependent relationship here, where breathing strongly relates to how quickly we become fatigued. Balance is an important action in any meditation, and just as important in running. The best running comes when you are balanced around your centre of gravity at the base of the spine, along an axis right up to your heart, which is the power generator of your body. When this line is balanced and you use your arms to propel yourself forward and stride out, a smooth rhythm and flow will develop. Energy is connected to thought. Thought can create both positive and negative energies. Positive thoughts overcome the fear of competitors, or the fear of the distance itself. By thinking positive thoughts you can overcome the negativity that saps into your psychic energy reserves. The mind at the beginning of a run is all over the place, be it the weather, the terrain, or the competition. The mind should be focused upon the single task of running, not about scenarios that haven't happened. Focus is extremely important. When running thinking about what one has to do after a run, what others are doing, and how far to go, etc., are distractions. The only important thing is to focus on the road ahead, say around 5-7 meters in front of you, and approach that area with balance and the right breathing. When you begin to concentrate on breathing, balance, and focus on the immediate space in front of you, it becomes much easier to think about only the 'here and now', where you can reach a new level of consciousness and performance about your running. This state allows you to feel upward and in control of what you are doing. In the 'here and now', time passes quickly, and you tend to be immune to the pain because of this state. In fact you begin to develop a good feeling of satisfaction and self confidence, enjoying the process of 'skimming over the road like a gazelle'. You are now performing at your best and its exhilarating to be there. You can feel your body flow or glide over the road as you stride out. Every step takes you forward. You will feel free of fatigue. You control the distance. It's a state of inward consciousness where you feel your body working, and outward awareness through the flow of the road. You can feel your inner energy within, where running meditation can provide you a grace that you never thought you had. Running meditation will allow you to determine your pace independently of others without worrying what others are doing, with a sense of supreme confidence, like any world class athlete. Just watch the confidence of former world marathon champion Robert de Castella in the 1982 Brisbane Commonwealth games Marathon. 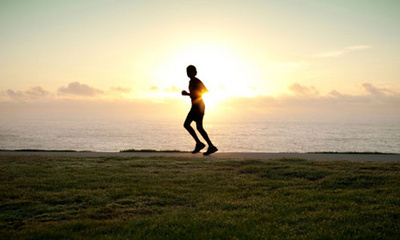 Running meditation integrates the mind and body. Achieving this state is not always possible every time you run. However when it is achieved, one has a great sense of mastery on the road where pace can be varied very easily. Running meditation is not goal orientated. It's about process of mind and body rhythm coordination. This allows you to run to your full potential. It nurtures, stabilizes, and allows you to perform at your best, bringing a deep sense of satisfaction about your running, no matter what the performance. It's about your performance and nobody else's. Running meditation is an expansive experience where you feel mentally as well as physically rewarded. Running meditation is a challenge to bring your running up to a new level. It gives focus and form to action in a unique way, allowing you to perform at a higher level. The training of mind and body is a flow. Running enables you to slip in and out of meditative awareness. Running at this level is about feeling everything happening in your body and being transient through space. The mind is a neglected element of running. It's as much about training the mind as it is about training the body. Running meditation is one of the last secrets of running that few truly understand, or know how to capitalize upon. Running meditation is the key to tapping your inner energies and achieving exceptional performances. A final word on running and meditation by Tibetan Lama Sakyong Mipham Rinpoche. ...I run in the mornings across and back the Sydney Harbour Bridge in Sydney, and at times find myself in a lightened happy state of nirvana when running.A rhythmic stride synchronised with my breathing, a focus on nothing other than the unity of myself with the natural environment around me , and I feel bliss......when I rush, I don't achieve the above state, but when I have time, and start off with a calm balanced mind, and a synchronised breathing technique,I sometimes achieve the above.Great article! !